Our goal of reaching all 50 high points has really taken a back seat to some other adventures of lately. We didn't bag any high points in 2014. But being we had a little more flexibility this summer, we thought we'd put it back on our agenda. We took a little road trip last week to Maryland's and Kentucky's high points. I wouldn't call them "on our way" to anything, but they were close enough to fit perfectly into our plans. Maryland's high point came first. 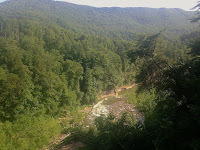 We camped nearby at Big Run State Park right on the Savage River in the western panhandle, scenic section of Maryland. Great campsite for just $10, but we got there really late and left pretty early the next morning, so we couldn't enjoy it as much as we would have liked. Getting up Backbone Mountain to Maryland's Hoye Crest (3,360 feet) requires a short, clearly marked hike (2 miles roundtrip) with an elevation gain of 700 feet. On the trail, you actually start in West Virginia and cross into Maryland, signified by a weathered 1910 concrete state marker. Even though hitting the summit wasn't particularly exciting (no views), Maryland is definitely one of those states that takes pride in their high point. There was a plaque, a huge rock cairn, a picnic bench, a mailbox with the sign-in book and certificate and even a platform to put your camera for a timed photo. Next up, we camped 2 nights at Breaks Interstate Park in Jefferson National Forest right on the Virginia/Kentucky state line. They call the Breaks the "Grand Canyon of the South" because of its 1,650-foot gorge. We had never been through this hidden gem of an area and really enjoyed passing all the once-thriving coal mining towns and the steep coal-rich hills. 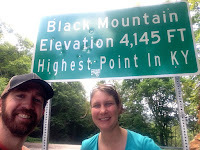 Getting to Kentucky's high point (Black Mountain at 4,145 feet) meant driving on steep roads with more curves than Jennifer Lopez. Apparently, the road to reach the high point is famous for putting cars in the trees and getting people car sick (guilty). We picnicked at the overlook, which is the only view you get. You can actually drive the last 1.4 miles from the overlook lot to the high point, but we opted for walking up the road. Only a handful of high points are on private property, but Kentucky's is on property owned by the Federal Aviation Administration. We had to mail in a waiver for permission to access it. With numbers 35 and 36 done, we can now say we've climbed all of the high points east of the Mississippi!